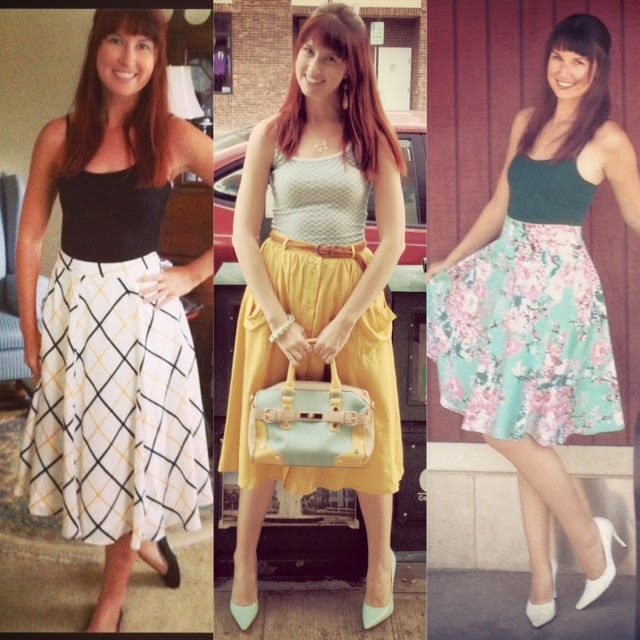 Modcloth is one of those sites that seems to get more popular by the month. For most of my fashion friends and readers I highly doubt I need to convince them that Modcloth is awesome! That said, when I got into Modcloth in 2013 I wasn't sure if the prices were justifiable and almost any garment had a bad review-like scathingly bad-so I wasn't sure how much I should indulge. Being quite the curious creature that I am I immediately started to Google what people thought of Modcloth and came across many reviews that pretty were anti-Modcloth in that they said the prices were inflated compared to other sites that carry the same items and that the quality was bad. For a hot minute this deterred me. But then Modcloth had one too many amazing sales by the end of the year so curiosity killed the cat, and I fell in love. I am now basically a professional Modcloth addict so I have to say that I wholeheartedly disagree with majority of the negative reviews. Granted, a few of those reviews date back a few years so possibly Modcloth has since worked out some of their kinks that I was never exposed to. But those bad reviews still exist on the inter webs so being a fashion blogger I want to put a counterpoint out there for arguably my favorite retailer to help level out the rumors! Below is a list of what the most common arguments against Modcloth are and why I either think they're wrong or easy to work around (and how to work around the issues for yourself). I hope it helps! They change the name of the items of clothing so it's impossible to find the clothes at possibly cheaper prices elsewhere. They do change the names, fair. Any name of any a given dress or skirt is some kind of pun that if you found the exact same garment on the brand's page or other retail site it would be an entirely different name. Perhaps it is to confuse people so that they only buy via Modcloth, but I don't know. That may seem "shady" but business is business so I can't totally begrudge them if that's their tactic in getting ahead. Easily. You can call and ask for the brand name if they run out of inventory and say that you want to find it on eBay or Google the brand in hopes of finding your dream item somewhere. If they don't list the brand (which sadly they don't always) and it's still in stock you can try saying that certain brands don't work for your figure so you wanted to make sure it was a brand you like, and then do whatever you want with that information. You can also Google Image search. OR search Modcloth hashtags via Instagram and see if you can find the item you want that someone else already has. Then you leave a comment saying you love their outfit and you wanted it but it sold out in your size (even if it hasn't if you're desperate to find a price comparison) and ask them what the brand is. 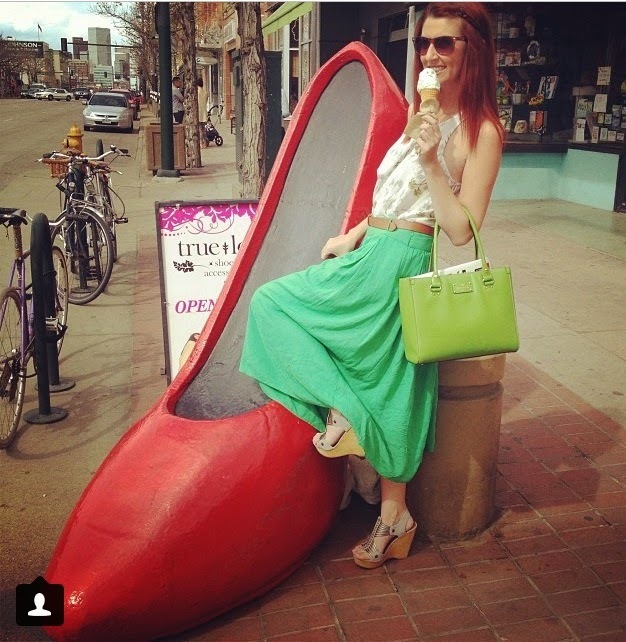 If this other girl has a photo of herself wearing the outfit with the #modcloth or #stylegallery hashtag, she probably loves it and will empathize with your quest. In fact, that's how I found the below dress when it really did sell out in my size AND was the first time I reached out to a fashion blogger while I was still being shy about starting my own blog. Two birds, one stone. *Note- Not every brand is easy to find. Some brands only sell wholesale to stores so you may not be able to find the piece you want at their brand's site. And, depending on how "hot" or "searchable" the brand is it may be tricky to find on eBay as the seller may or may not list the brand. You can always search the brand and the Modcloth given name and save the searches to see if anything pops up in the future. The prices are inflated compared to other similar online retailers that carry the same items. Honestly, in my experience yes and no. Once you fall down the vintage inspired rabbit hole you begin to find other similar sites via Google searches, Instagram friends, and whatnot so you begin to see certain brands pop up on sites that are a similar idea as Modcloth. So if you're perusing various sites every week you're bound to see some of the same items pop up. I have definitely seen a dress being sold at Modcloth be both more expensive or less expensive on given sites. It sometimes is more expensive-like if I had to pick because a gun was pointed to me style of answering-but that doesn't take away from the fact that I have for sure seen Modcloth have the lowest price in town on several items too. Easily. For one, even if Modcloth is carrying the dress you want at the most expensive price on the block, that may not stay that way. For one thing, Modcloth has the best sales in town. Period. Twice a year a huge part of their inventory goes on sale for 50% off...and sometimes even up to 70% if they're trying to get rid of inventory to make way for new items. Just because you are foaming at the mouth in love with the dress of your dreams doesn't mean everyone else is. In fact, your dream dress could fail to perform sales wise and depending on how much inventory they have coming in the price could get reduced within a month. I got this amazing Hell Bunny dress (below) for $35 dollars (originally $70 on Modcloth and similar sites) and I guess it didn't sell well so it went on sale after being on the site for 1-2 months. Other sites still have the dress for $70. You can luck out. Also, because Modcloth is giant compared to most of the similar retailers, they can afford bigger markdowns. Let's take Bernie Dexter dresses for instance. They usually sell for $156 a pop. Tons of other sites (that will not be named) sell BD dresses. But when a BD dress goes on sale on the other sites, it's usually marked down from $156 to $108-$129. That's nothing to sniff at but it's still a dress in the three digits and depending on your budget this could make you sad. But when a BD dress goes on sale at Modcloth, it typically is $108. But then if it still doesn't sell, it'll go down to $75 or somewhere in that neighborhood. At the end of last year Modcloth even marked down half of their BD dresses to $45 on clearance. NONE of the similar Modcloth sites do this. The dress will just sit at $122 until it sells out. The only chance you have at finding a similarly priced BD dress is either on the Bernie Dexter site or her eBay store. Her site occasionally lists dresses on sale for $55 and she sometimes starts auctions for her dresses at $25 (I've gotten the a dress for a winning bid of $46 but sometimes even starting at $25 I've seen dresses go up to $99 as the winning bid. It depends. Best of luck to you all!). Also, BD dresses are sometimes sold at a lower cost on eBay by people who are purging their closet. Beyond playing the "luck" game on eBay you probably won't have any luck finding a better on sale price of a Bernie Dexter dress outside of Modcloth. 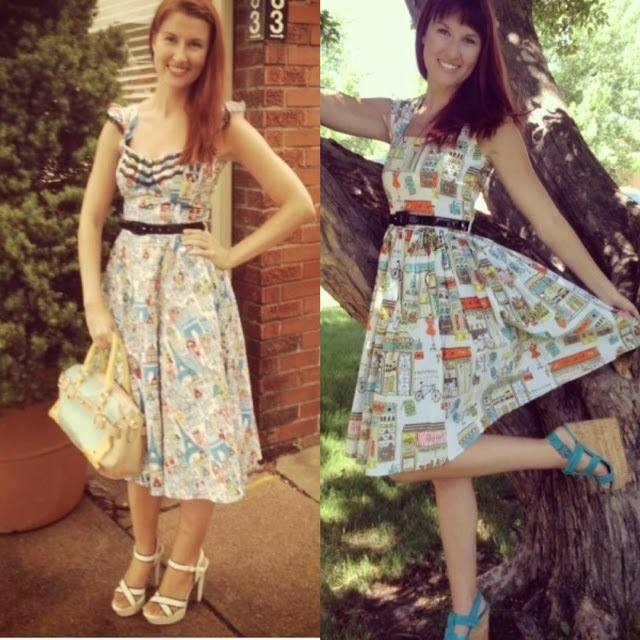 Two Bernie Dexter dresses I got for under $100 at Modcloth...and with store credit, but more on that later! The quality of the clothing is poor. Here's the deal: I've gotten clothes from Modcloth that are both the best fabrics that my fingers were ever blessed enough to touch in my life as well as a few items that made me raise an eyebrow and say, "Really?" There are ways to help you decide which way it will go before you buy though! An example of "one of the best fabrics that my fingers were ever blessed enough to touch"! 1) Reviews can certainly help. If the fabric is bad or the zipper is tough or the fit is boxy, people will care enough to review it and chances are those issues will come up multiple times. 2) Read what the fabric is made of. Several times people will review that they were disappointed with the quality of the fabric but then admit to wrong doing on their behalf because upon a second look they realize it clearly stated that the dress was made of a fabric they don't like/trust. 3) If you're familiar with a brand you should be able to gage your success with what you want to buy. And even if you haven't personally tried that brand before, search the brand throughout the Modcloth website, Internet, or Instagram to educate yourself on the pros and cons of a brand. Besides, again, if you hate the quality and it's not on final sale (anything below 50% off) you can return it. It's disappointing but far from the end of the world. The fit is weird and the fit/quality/whatever else doesn't justify the price. Well, sure...if you're not used to clothes that are modeled from mid-century fashion. Past that I'd say they fit as well as any other clothes you may find elsewhere. 1) When I got my first longer skirts and Bernie Dexter dress from Modcloth my brain didn't know how to process the fit of the items. Higher waisted was somewhat new to me as were such conservative lengths. I liked the items but past that I was baffled as to how much I loved or intended to keep them. I had to play around with them a bit with different shoes or tops to figure out how I really felt. Given that you can rarely find that kind of style in a mall, you may need a moment to adjust what a higher waist feels like or how confident you'll be in that. Sometimes I read reviews on Modcloth and the reviewer clearly states that it's her first Modcloth purchase and she hates the dress and can't believe just how high waisted it is. And I'm thinking, duh, it's styled based on a 1950s wardrobe and not a 21st century one. But even if you love watching old movies or the fashion on Mad Men...it may take a second for your brain to process how you feel about you dressing that way. That factor could be playing into how you like the quality or fit. These are hard to find at a mall! And again...I got majority of these on sale or with store credit so still not that expensive! There are also several wonderful things about Modcloth that don't come up very often in reviews of Modcloth. Here's a list of pro-Modcloth points that I've made just based on my own experiences with them alone. 24/7 customer service...with the nicest people you will ever find in customer service...EVER! Not only are they nice, but everyone I ever spoken to seems intelligent! Sometimes it's hard to explain why there's a problem or what you're inquiring about and they have the utmost patience and always seem to "get it." Being nice and being mentally quick on the uptake is not a given in customer service, so yay for Modcloth doing something right! If your item gets lost in the mail they replace it immediately at no extra cost. Seriously! I noticed after my tracking said that a package was delivered and it wasn't that my mailman lost/delivered to the wrong unit or something and I had another dress overnight Fedexed to me, no questions asked with no extra cost. This dress was the one that got lost in the mail and then a replacement was FedExed immediately to me. You can ask a stylist to help you pick out a particular size. Truth, I have been led astray here before (more on that at the next point). Sizes online can be confusing, especially on such a massive retailer like Modcloth where any dress you could fall in love with could be a brand you're totally unfamiliar with. When they put the number sizes out I get confused. Like, I'm a 00 in JCrew but a 4 in H&M. How on earth do I decide on a 0, 2, or 4 for a dress from Modcloth? But 9/10 times if you give you measurements to a stylist and explain how you like the fit of your dresses, you will find the right size for you! If something doesn't fit as expected, they will do everything possible to make sure you get the item in the right size as quickly as possible. The dress below I was tortured over not knowing the sizes so I called in to talk to a stylist for the first time. Something must have gotten mixed up in the wires because the dress size she suggested was way too big in the bust/arm pit area. I had wanted this dress for ages and it was on sale so I was afraid it would sell out if I waited for the exchange to go through. I (politely and calmly) called again and explained that I had been accurate in my sizing but one of the smaller sizes should have been recommended it to me. We were able to work out something and I got the correct size within two days. So despite a less than ideal first time experience with the stylist function, I have not been deterred from both Modcloth or utilizing a stylist since (and have always been led in the correct direction since). I was led astray size wise here so they did everything they could to get a replacement dress to me immediately. If you don't like your item you can get a refund if you return within 30 days or store credit if you return within 90 days. That's pretty damn good! 30 days is a lot to play around with it you want a refund (a lot of sites do 7-14 days, or even you have to contact them within the first 24 hours if there's a problem!) and I know first hand that store credit is fun to play with! I bought a lot with winter/spring sales, but they weren't final so when when a majority didn't fit as intended (I had a slump for a few months!) I opted just to do the store credit because I knew I'd fall in love with another dress (or dresses...) so I may as well have that option of it already being paid for waiting for me! And with a few returns on some midsize priced items, it added up and I was able to get some Bernie Dexter dresses (a brand I trust with sizing) so all was well that ended well! Free shipping if it's above $50 (not hard to do at Modcloth) and free returns. Enough said there. But PS- let's say you get something and your grand total is $35. You have the option of a $4 shipping where it will take 4-9 days, or $8 if you want it quicker. A lot of similar retailers actually have a flat rate of $8-12 which makes the cheaper purchase feel defeating. At least with Modcloth you have choice of how much shipping is and you don't have to pay 25% of your grand total on top of everything just to ship it. A lot of customers review the garment with great details, and often list their sizes. There are other sites (again-they'll remain nameless) who absolutely have this function but I've never seen nearly as many reviews as Modcloth has on most of their items. Anytime I'm on the fence about sizing or quality, I just read through the reviews and find the information I'm looking for. Modcloth has tons of searchable hashtags on Instagram that can help you find a better photo of someone wearing your dream dress if they haven't posted on Modcloth's website. When I first got into Modcloth I viewed their hashtags as an extension of their Style Gallery as not everyone posts to the site and I could see items I wanted and how they looked on other girls...OR fall in love with items I never would have considered otherwise because they were worn so well!! There's literally some kind of sale almost every week between items going on sale normally and random departments becoming 15% off for a 48 hour period. Items I've found on quasi sale to mega sales! Right before St Patrick's Day they had some percentage off of green clothing. Occasionally apartment ware, certain kind of prints, or other things that can be grouped together nicely go on sale for 15-30%. Your best best is to have an account so you get the emails, follow their Instagram, and/or get the app on you phone to see the notifications first. The way I see it is that it's yet another argument that kind of deflates the whole "overpriced" thing. 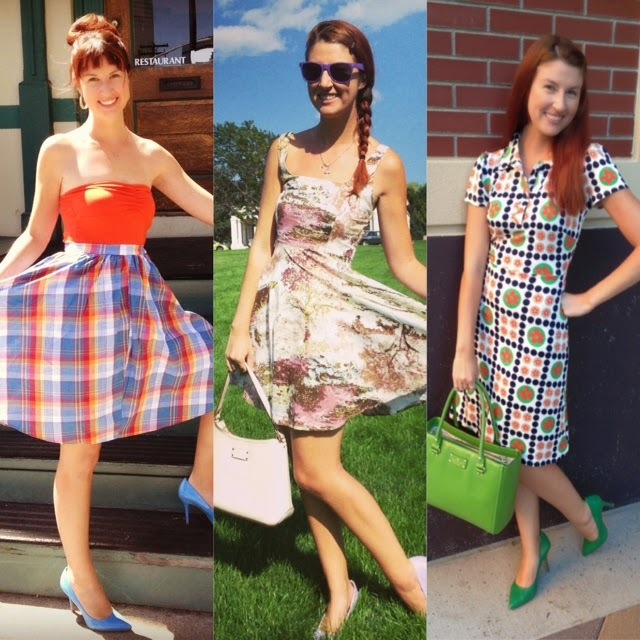 To end this post, the long and short of it is that I trust Modcloth. So much of their inventory goes on sale and the customer service is unbeatable, so unless I absolutely can't I try to get whatever item I want from Modcloth as opposed to competing sites. That's why I had to do a "Gaga for..." post involving them and why I needed to drown out some of the bad reviews from older blogs! P.S. Bristol is a total sweetheart! Bristol IS a doll! :) Omg- I should add that in an edit because you're totally right about the measurements thing and I've done that before and spaced. Two heads are better than one!! Thank-you, darling! And I wish they had a store too!! Lol. Heya! I bet that makes it soooo much easier with shopping overseas! That's basically when I got my first Bernie Dexter dress too!! I'm SUPER excited already for their Black Friday sales again lol! This was a great post! I agree with you, of course!! :) Modcloth is amazing, and really helped me develop my current style. (And I think, permanent style.) You just can't find clothes/shoes/accessories at the mall like what Modcloth carries! And thanks so much for mentioning me! That was very sweet of you!